I have a complicated relationship with my Keurig. It was given to us at Christmas by my husband’s children. It was an amazing gift, thoughtful, inventive, and big. It is big. It is also streamlined and beautiful. I’d never seen anything like it before, which made them laugh hysterically (as it did half my friends). Confession: I don’t work in an office and when I do go to offices, they don’t usually invite me into the kitchen. The fact that I’d never seen anything like it before made me feel a little bit like Abe Simpson. I have a friend who wanted to buy stock in Keurig and is mad at her husband because they didn’t. Apparently it was a good stock buy. I’m not sure I would want to buy stock in Keurig because I’m not sure it’s ecological and I have an issue with that. Also, I missed the boat. 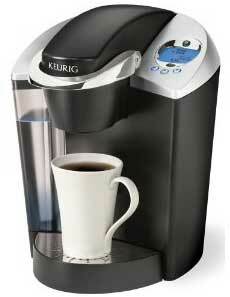 The time to buy the stock was when the Keurig came out, not when it arrived in my kitchen last December. I had no idea how to work it. It’s simply really but it’s also quirky. The little container has to be lined up just right, the disposable coffee thing dropped in after it’s heated. There’s an eco friendly filter, too, but the one we have doesn’t work so well. My friend who wanted to buy stock says there’s another one that works better and she just sent me the link. It’s red, though. I’m not sure why. 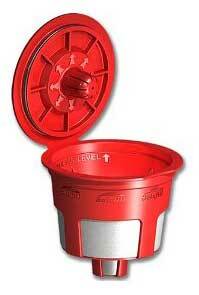 I still think eco-filters should be gold but I’m old-fashioned. It also makes tea. And apparently hot chocolate, but I haven’t tried that yet. Sometimes I pour a little half and half into the bottom of the cup just as it starts brewing in an effort to make a faux latte. This only sort of works. But it’s fun. It also talks to you in the morning, ready, not ready, and the little display tells you when it’s time to add water. Sometimes it says “Prime.” (Yes, I realize I’m starting to anthropomorphize my Keurig.) “Prime” apparently means you’re supposed to dump the water out and refill it but since we only use bottled water that feels wasteful so I figured out how to game it. If you just unplug it and plug it back in, the “Prime” message goes away, making me wonder how smart it is really. I am happy that I’m smarter than my Keurig. I’m thinking about naming it. I will start to worry about one of us though, if it starts to respond to its name.